Heron was a critic and painter who championed an approach to painting that assessed quality according to such formal values as the flatness of a composition and colour. Of his stripe paintings he wrote, ‘The reason why the stripes sufficed ... was precisely that they were so very uncomplicated as shapes ... the emptier the general format was, the more exclusive the concentration upon the experiences of colour itself.’ Heron resisted the total abandoning of subject matter and even such works as this have been seen in relation to landscape, the horizontal bands and colours perhaps suggesting the horizon at sunset. Inscribed ‘PATRICK HERON JAN–FEB 1958’ on back of canvas t.r. also ‘TOP’ with arrow. Inscription repeated on upright of stretcher. Also signed ‘Patrick Heron’ (circled) on lower half of stretcher upright. Canvas, 108 x 60¿ (274.5 x 154.5). Purchased from the artist through the Waddington Galleries (Grant-in-Aid) 1972. Coll: Commissioned E. C. Gregory for Percy Lund, Humphries and Co Ltd 1957; at 12 Bedford Square, WC1 1958; returned to the artist early 1970; on loan to the Tate Gallery 1970–72. Exh: Whitechapel Art Gallery, June-July 1972 (11, repr. in colour); Henry Moore to Gilbert and George, Palais des Beaux-Arts, Brussels, September–November 1973 (85, repr.). Lit: Patrick Heron quoted in ‘Two Reception Rooms’, Architecture and Building, October 1958, pp.396–7 (repr. ); ‘Offices at Bedford Square WC1’, Architectural Review, November 1958, p.324 (repr. ); Ronald Alley, ‘Patrick Heron: the development of a painter’, Studio International, July/August 1967, p.20; Alan Bowness, ‘On Patrick Heron’s Striped Paintings’ in catalogue of retrospective exhibition, Museum of Modern Art, Oxford, May–June 1968, p.64; Patrick Heron, ‘Colour in my Painting’, Studio International, December 1969, p.204; Patrick Heron, Letter to the Editor dated 17 May, 1970, Art International, September 1970, pp.79–80; Alan Bowness, ‘Introduction’, Patrick Heron, ‘Notes on My Painting 1953–72’, in catalogue of retrospective exhibition, Whitechapel Art Gallery, June–July 1972; Patrick Heron, ‘The Shape of Colour’ (Text of the 5th Power Lecture), Studio International, February 1974, pp.65–67, repr. p.68. Repr: Edward Meneely and Christopher de Marigny, Patrick Heron Retrospective (87 colour transparencies and text), 1970. The painting was made for the reception area at the London offices of Percy Lund, Humphries and Co Ltd, part of which was being redesigned by the architect Trevor Dannatt to include an enquiry counter, secretarial space, a switchboard and a small waiting area with additional office space in an adjoining room. One of the main features of Dannatt’s scheme was a lowered ceiling of painted wood slats hung edge downward at two levels and at different spacings between two deeper members running away from the canvas at right angles. The slats thus echoed and continued the stripes in the configuration of ‘Horizontal Stripe Painting: November 1957– January 1958’, which was commissioned for the end wall of the reception area just inside the entrance. The painting was conceived as an integral part of the architecture in terms of size and was made to fit the space allotted to it very closely. 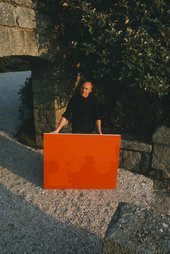 It was however commissioned—the artist told the compiler—on the basis of a small transparency of an earlier vertically striped painting—which happened to be T00962, ‘Scarlet, Lemon and Ultramarine: March 1957’. The painting was delivered to Bedford Square by the beginning of February 1958 but the room was then not quite ready and the canvas hung in E. C. Gregory’s office for many weeks before installation. The painting remained in situ at Bedford Square until early 1970 when it was taken off the wall for photography and restoration by the artist (following the last decoration of the room, paint from the low end bar of the slatted ‘ceiling’ had been stenciled onto the picture). A sheet of perspex had already been fixed to protect the lower part of the surface of the picture, but it was now decided, in view of its extremely vulnerable position next to the entrance, that an overall protective frame should be made for the painting. This was devised by the artist, but when the painting was returned to the room it was found that the original measurements had been so precise that it was impossible to fit the painting into its position without damaging the architecture. Lund Humphries therefore agreed to exchange the painting for one of a smaller size, which now hangs in their Bradford offices. The space originally occupied by Heron’s painting in Bedford Square is devoted to a display of Lund Humphries’ publications. Patrick Heron wrote an account of his interests and intentions in this painting for Architecture and Building (loc. cit. ):‘My main interest, in my painting, has always been in colour, space and light. My interest in fact is always in space in colour and space in colour is the subject of my painting today to the exclusion of everything else. But the space must never be too deep or the colour too flat. Each painting has to adjust depth to surface in a new and unique manner. Just as you cannot place colour on a flat surface without partly destroying its flatness (it is a physical property of colour that different colours in juxtaposition appear to advance or recede), so also you cannot make marks on a flat surface without creating a purely surface organisation, i.e. a design. Painting has therefore to synchronise, in every gesture or statement, two distinct types of organisation—one is illusionistic depth, the other across the surface of the canvas. The chance to work out this perennial problem of painting (of flattening deep space onto canvas) within the physical setting of an architectural arrangement which invites it —this only occurs very rarely. The artist wrote about these stripe pictures in ‘Colour in my Painting’ Studio International (loc. cit. ):‘Early in 1957, when painting my first horizontal and vertical colour-stripe paintings, the reason why the stripes sufficed, as the formal vehicle of the colour, was precisely that they were so very uncomplicated as shapes. I realised that the emptier the general format was, the more exclusive the concentration upon the experiences of colour itself. With stripes one was free to deal only with the interaction between varying quantities of varied colours, measured as expanses or areas. ‘All my stripe paintings were done in very thin oil colour (thinned with lashings of turpentine; and most of the colours were used unmixed, i.e. at full strength as they came straight from the tube—this has been my practice since about 1950 actually). A well-known New York art-critic saw most of these stripe paintings at my house in Cornwall in December 1957. About three years ago he again saw “Vertical Light: March 1957”… and immediately recalled having seen it on that visit to Cornwall ten years previously. ‘Sketch for Lund Humphries Mural: February 1958’, 20 x 12 in. (collection Mrs Susanna Ward), is one of four canvases related to the painting but is not a study in the ‘preliminary’ sense. The artist pointed out that with one exception he has never made large paintings from small ones.